There's a wide selection of entry-level motocross boots under $200 that offer the beginner dirt bike rider good protection at an affordable price, and some of the boots are closer to $100. You've probably spent more than that for a pair of running shoes. If you're a beginning rider and plan to stick with the sport, you'll need to get a pair of motocross boots at some point. Motocross boots take some getting used to as far as shifting and braking, and the extra weight makes it harder to hold your leg up in a turn, so it's way better getting used to them right from the start. This isn't meant as a 'best entry-level motocross boots' list, but the following brands have been around for many years. The boots were included based on the manufacturer's list price, not the Internet price which is almost always lower, and the only way to know the current price is to check the price just before you buy. All links go to Amazon unless otherwise noted as it would be impractical to include links to the many Internet e-tailers. Don't forget to check shipping and return policies at the various e-tailers before buying. Gaerne wasn't included because their entry-level MX boot (the GX-1) has a list price of $219 and the cutoff price was $200. The TCX motocross boots are covered in the TCX motocross boots post. And now, on to the boots . . .
AXO is an Italian company established around 1978, and in 2003 they established AXO America so they've been in business quite a while. Their entry-level motocross boot is the AXO Drone (Amazon) which lists for $125 with the Internet price currently only slightly less, so even though the Drone has the lowest list price it may not be the cheapest MX boot. The Drone offers a durable synthetic outer material which helps resist wear, and a synthetic leather heat guard. There's a flex panel at the back of the boot for flexibility, but not a huge amount of heel padding. The sole is a Goodyear welt design with double stitching and a steel shank. The Drone offers a PU (polyurethane) four-buckle EZ-Lock closure, the buckles are replaceable, and the bottom buckle has good deflection protection. The Drone is available in black. The Drone boots have an average 4.0 rating based on roughly 25 reviews at the various motorsports retailers, and it's also rated 4.0 on Amazon with numerous reviews and several answered questions, so the Amazon Q&A are probably worth a read before buying. 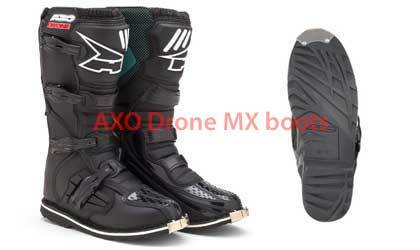 The AXO Drone is a basic entry-level motocross boot that's priced accordingly. Fly Racing has been around a long time and one of the first motocross boots we ever bought were a pair of Fly 805s over fifteen years ago which lasted for quite a few years. 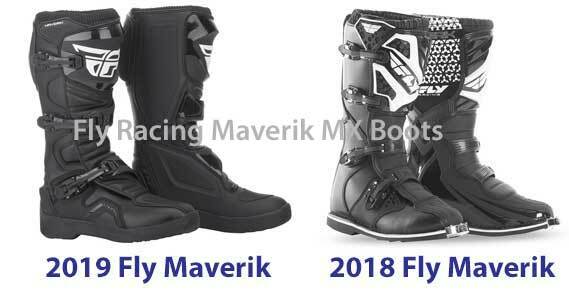 Fly Racing's Maverik boots have been updated for 2019 and it's great to see Fly revising the Maverik while still keeping them affordable. The 2019 list price is $129 for black or white, and $139 for colors, and you can probably find the 2018 and older Maverik boots for around $100. The Maverik offers pre-shaped molded plastic on the shin area and flex zones at the front of the boot as well as the achilles area. There's a good amount of padding around the ankle area and the articulated rear ankle offers flexibility without sacrificing support. There's a synthetic heat guard and the stitching is recessed around the molded plastic impact points. The Maverik uses a three-buckle closure with memory straps and adjustable quick-lock buckles. The bonded welt sole has a steel shank for support, but we honestly have no idea what Fly means by a 'fish tail' midsole. 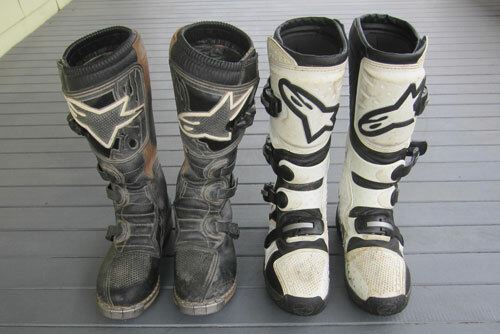 Most inexpensive entry-level MX boots only come in black or white, but the Maverik boots come in four colors (white, black, red, and hi-visibility). All in all, the Fly Maverik is good, solid, entry-level motocross boot with a proven track record, all at a very affordable price. The O'Neal Element boots (Amazon) are a long-standing entry-level MX boot favorite, and received a redesign around 2015. The list price is $139, but the Internet price has been closer to $100 for quite some time. The redesign gave the boots new buckles and a wider calf area which is good for riders with big calves, or those wearing shin guards or knee braces. They also made the contact points more pronounced for improved contact with the bike and better protection for those high abrasion areas, and there's a synthetic leather heat shield for added protection. The lower part of the boot offers good impact protection and the injected molded plastic runs completely around the inside of the boot and wraps around the toe box. There are front and rear articulation panels for flexibility, and good padding in the ankle and heel areas both inside and out. There's an AirMesh interior for comfort and breathability. The Element boots have a durable Goodyear welt bonded sole with a metal shank, and the semi-aggresive design offers plenty of traction. The four-buckle closure straps are fully adjustable and replaceable, and the bottom buckle has good deflection protection. The Element is available in black, and white/black. The image below shows the Element in black along with the sole. The O'Neal Element boots have an average 4.5 rating based on roughly 75 reviews at the various motorsports retailers, and has quite a few reviews and answered questions on Amazon, so the Amazon Q&A are worth reading. 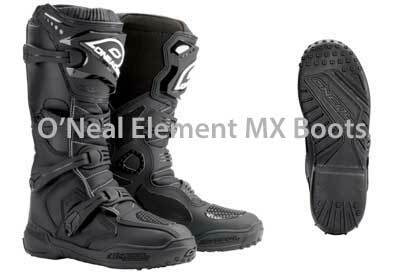 The O'Neal Element is another solid, time-tested entry-level motocross boot with great feedback that offers very good protection and has its own distinctive look. For just over $100, you really can't go wrong. p.s - O'Neal also offers a slightly cheaper entry-level Rider boot (Amazon) which is essentially the same boot, only with a more aggressive ATV sole. They're easy to tell apart because the Rider has a metal toe cap and the Element does not. If you primarily ride dirt bikes, go for the Element instead of the Rider. 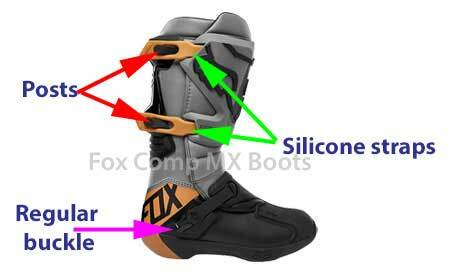 The Fox Comp 5 motocross boots were Fox's entry-level MX boots for many years, but the Comp 5's are slated to be replaced in 2019 by the Fox Comp boot, so this synopsis is for the new 2019 Fox Comp boots, not the Comp 5. You can still find the Comp 5 boots on Amazon and since they're being phased out, you might score some good deals (the Comp 5 list price is $199). Alpinestar's entry-level motocross boot is the Tech 3, which has a list price of $199. We have several pairs of Alpinestars Tech boots (one pair of Tech 4s and two pairs of Tech 3s) and have been really happy with the boots. The photo below shows a pair of Tech 4s on the left and a pair of Tech 3s on the right. The Tech 3 boots have been around for a long time, and were redesigned in 2016 and the redesigned boots now have three buckles instead of four. The (newer) Tech 3 motocross boots have an upper that's made from lightweight synthetic material for flexibility, durability, and abrasion resistance, and there's a flex panel in the rear for comfort and flexibility. The toe box is constructed of synthetic material for durability, and has a nice low profile making it easier to get under the shifter. There's a contoured TPU calf protector plate and good TPU medial protection. The ankle area is well protected both inside and out, and there's a replaceable EVA insole. The three-buckle closure system includes 3 polymer buckles with memory straps and a quick release/locking system with a self-aligning design for easy closure, and the buckles are replaceable. The high grip rubber compound (mid)sole is replaceable. The Tech 3 boots come in four colors and in sizes from 5 to 16, which is the largest size range of any other entry-level motocross boots. The Alpinestars Tech boots we have were comfortable right out of the box and the sizing was perfect, so we're guessing the new design is the same. The Tech 3 boots have an average 4.5 rating based on roughly 88 reviews at the various motorsports retailers, and you can check the latest price on Amazon. The entry-level boots on this list should get you pointed in the right direction and give you an idea of what you can buy for less than $200.